Performing in the sweaty basement of the MAC, Millimetrik was one of the many free shows that EM15 offered throughout the festival. These gratuitous gigs exclusively involved Canadian artists, the bulk of which are from Quebec. 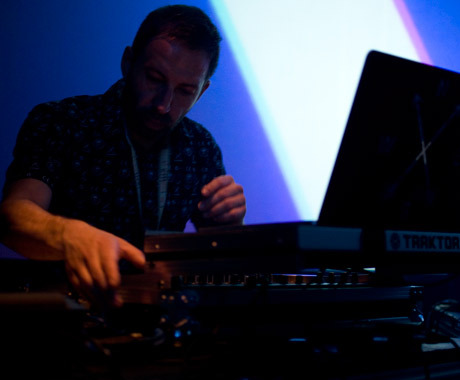 Millimetrik, a Quebec City resident, offered a mix of ambient backdrops behind instrumental hip-hop and low tempo electronica. His setup consisted of a laptop, sampler and pads, which he manipulated with a pair of drumsticks, adding some much needed liveliness to the show. Strangely though, this only made Millimetrik the most energetic person at the gig, as he bounced his way through the entire set. Perhaps it was the heat inside the venue or maybe the slow pace of the music, but the QC producer failed to get any bodies moving for the duration of the show. In fact, a large portion of the crowd were content to sit on the floor. As the night went on, those numbers only rose. The show was a run through Millimetrik's latest album, Lonely Lights, and even though the end of gig featured upbeat tracks "Lumieres Solitaires, Qui Disparaissent Dans le Brouillard" and "Metaphores / Megalopoles" the atmosphere remained one of indifferent observation.